In the past, comic conventions served as a place where fans of Marvel, DC or other comic publishers could pick up rare back issues on the cheap and hang out with fellow superhero fanatics. Today, conventions, or “cons” as they are affectionately called, are more than just over-sized comic book flea markets – – they have become the haven for all things multimedia, especially upcoming projects from the world of video games. This year’s New York Comic Con, held this past weekend at Manhattan’s Jacob Javits Center, was chock full of upcoming gaming titles – – some were close to their release date, while others were a bit farther on the horizon. Marvel vs. Capcom 3 – Fate of Two Worlds (PS3, X-Box 360, Spring 2011): With two massive play areas devoted to this game alone on Friday, it’s hard not to see Capcom’s vested interest in the 2-D fighter’s success. And thought it is set for release in Spring 2011, MVC3 looks like a game ready to hit stores today. All the elements of its fan favorite predecessor remains – – three on three tag-team like battles, over the top, super-bar draining finishers and a roster of comic book and video game characters that reads like a who’s who of recent pop culture history. But, that’s where the similarities between the two games end. The graphics for this iteration look absolutely stunning with its vibrant and loud color hues, interactive on-screen scoring elements and over-the-top character taunts. Every fighter’s attack – – especially each special finisher and accompanying pre-move cinematic – – engulfs the whole screen, leaving an indelible, and sometimes headache inducing, visual imprint. Deadpool’s bright red (and sometimes tangerine orange) jumpsuit draws the eye whenever he is in combat. Iron Man and Thor’s energy-based projectile attacks zoom across the screen in a bright yellow and furious blaze and the stark contrast between 2-D fighting and 3-D backgrounds add a level of previously untapped ocular depth that adds to the overall presentation. Gameplay in Fate of Two Worlds takes the Marvel vs. Capcom series’ super-charged fighting system to completely new heights. Games have to be sharp if they want to keep up with digital combatants that battle as if they were injected with a cocktail of pure adrenaline, extra strength Red Bull and nitrous oxide. At the booth, the roster was limited to only a handful of characters but exhibitors promised the final game will have familiar faces like Ryu, Wolverine and Captain America and a couple of newcomers like Fantastic Four enemy Super Skrull, Dante from the Devil May Cry series and Chris Redfield from Capcom’s successful zombie thriller franchise Resident Evil. Fans of Marvel vs. Capcom 2 have waited for a top-notch sequel to their coin-op champion for nearly a decade. By the looks of things, their patience will be greatly rewarded come next Spring. Warhammer 40,000 – Space Marine (PC, X-Box 360 and PS3, Spring 2011): The popular Warhammer series of PC games never really caught my attention in the past. But after seeing some of the gameplay elements from Relic’s upcoming third-person action-RPG, consider my interest in the franchise massively peaked. One part Lord of the Rings, one part Gears of War and one part Final Fantasy, Space Marine is rumored to tell the story surrounding an Orc invasion on an Imperial construction planet, charged with supplying weapons and armor for the Imperium of Man. The Orc’s goal is to steal a Warlord battle titan, a gigantic walking tank that could turn the tide of the war in their favor. Your character, a commander of an Imperial Space Marine Task Force, is sent to the planet to prevent the walker from falling into the enemies hands. While I didn’t get a chance to play the game at Comic Con (it’s still very early in its development), the trailer Relic showed at their booth looked very promising. With such outstanding battle animations and graphics, huge over-the-top cinematic elements and a rich mythos to draw story content from, Warhammer 40,000 – Space Marine could earn many critical nods for Game of the Year in 2011, including my own stamp of approval. Red Dead Redemption – Undead Nightmare Pack (X-Box 360, PS3, Coming Soon): Red Dead Redemption is quite possibly the best free-roam shooter/action game ever made. The gigantic size of the digital sandbox that is New Austin, mixed with the overwhelming amount of activities and achievements for gamers to explore and conquer, make it a game with great replay value and a leading candidate for many game website’s 2010 Game of the Year Award. Watch your ammo reserves closely, otherwise you'll find yourself caught in a similar situation. Rockstar Games, coming off the heels of the recently released Outlaws to the End and the Liars and Cheats DLC packs, have at the ready another chapter to add to their Wild-West franchise’s overall story – – namely, a frontier-wide zombie infestation. Undead Nightmare, a single player based side campaign, pits Red Dead’s John Marston against an undead army as he races to find a cure for the zombie plague sweeping across New Austin. 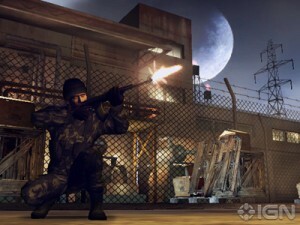 Though they wouldn’t let the press tape gameplay footage, Rockstar did set-up a large gaming area where attendees could sample one mission – – a raid mission in an infested cemetery – – found early on in the campaign. The objective was to burn all the infected caskets in the area while fending off awakening zombies and a final boss that tried my patience and ammo reserves. I was told by the exhibitor that the Undead Nightmare pack will introduce a new toy for Marston to play with: the Blunder Bust, a semi-automatic shotgun-like weapon that uses zombie parts as ammo. Basically, it keeps replenishing itself with the remains of your fallen foes, which is a good thing considering ammo is scarce in this DLC. After taking stock of my available arsenal, I jumped right into the fight. After running, shooting and dodging all the flesh-eating nasties occupying the cemetery for upwards of 10 minutes, the level was complete. The overall experience was both amazing and nerve-racking – – at one point during my session, the hordes kept coming until I was surrounded at all sides. It took some up-close head shots, accurate shooting and some quick thinking on my part in order to complete the mission (I tricked the zombies into following me past one of the burning caskets, which set the chasing fools on fire). And you though the live ones were tough . . . The nervous, edge of your seat tension (common place in all zombie related fare), mixed with the familiar gunplay and engaging storyline, created a thoroughly enjoyable and highly impressionable gaming experience. Mission accomplished Rockstar. I’m just glad that I didn’t have to face off against the zombie bear. Shudder to think how I’d fair against that beast. I guess George Clooney was wrong - - Superman doesn't work alone. The explanation did not go over well with many fans following DCUO’s development on the game’s official Facebook page. New York Comic Con was the first major gaming expo where Sony featured a playable version of the game since the announcement. And though it’s still far from going gold, it currently stands as a beautifully structured and accurate rendition of the DC Comics universe. The demo level available on display featured a playable tech character, resembling a futuristic looking version of the lesser known DC hero Shining Knight, tasked with the mission of saving Robin The Boy Wonder from the evil clutches of The Joker’s favorite gal pal, Harley Quinn. As the Shining Knight clone rushed into Harley’s hideout, he immediately faced a group of henchmen sent by Harley to intercept him. The created hero wielded an large sword, which he used to clear out the enemies with a mix of close quarters energy-charged melee attacks and long range projectiles. With her bodyguards wiped out, Harley rushes in and takes her chances against the budding superhero. Once she was vanquished and Robin was freed, a “Headline Achieved” message popped up and Jim Lee drawn cinematic showing the aftermath of the episode played on the screen. Harley was on her way to Arkham and your character just earned some brownie points with your superhero mentor Batman – – not a bad day’s work for an up-and-coming hero. All kidding aside, the action flows smoothly, allowing players to chain attacks and conquer multiple opponents with a few keystrokes or button mashes. The created characters’ look and mannerisms are very intricate and detailed – – this particular creation had energy rushing through his sword and the wired coils weaved into his bodysuit. Each of Harley’s minions had their own individual looks, clothing and attacks while Harley herself acted like her comic book counterpart, running around the battle arena cackling wildly with her usual chaotic disposition. So, for those of you concerned about DCUO’s progress, my message is simple: don’t worry about a thing. By the looks of the hands-on demo, the developers are definitely on the right track and this delay can only add more depth, richness and polish to an already stellar looking production. Goldeneye 007 (Nintendo Wii): The original Goldeneye, released by Rareware in 1997 for the Nintendo 64, laid the foundation for every first person shooter game on the market today. It introduced the world to the lucrative nature of video game/movie tie-ins, revitalized the Bond franchise’s popularity and lifted Nintendo’s ground breaking console into the annals of gaming history. Cool under pressure, 007 can make mince meat of this grunt. Too bad the final product looks nothing like this though. Today, Eurocom wants to recapture the magic of yesteryear with the upcoming re-vamped Goldeneye 007, set to hit stores on November 2nd for the Nintendo Wii. With an updated graphics engine, a re-worked storyline created by the movie’s original scribe and new online multiplayer game modes, the venture seems like a slam dunk on paper. But, as military history attests, it’s one thing to plan out a covert-operation – – it’s an entirely different task to successfully execute it. A four-player multiplayer demo was available at Comic Con and as I was playing it (in which I destroyed all comers earning me a special “Cheater” t-shirt for my trouble), I felt like I was a teenager again sitting in my living room playing free-for-all sessions with my friends. Dr. No, Xenia Onatopp and Odd Job – – played by other Comic Con attendees – – chased my character, the great assassin Francisco Scaramanga, around an industrial construction site with multiple levels and numerous hiding spaces. There were bowler hats flying everywhere, devastating melee attacks and of course, the ever powerful Golden Gun at the ready. But something was missing during this brief exhibition: the “wow factor” that came with the original offering. Once the novelty of the moment wore off, all that remained was an uninspiring game that looked its age. The character skins were very muddy and over-pixelated, the sound effects were dull and lackluster and the gameplay overall lacked the intricacy found within many modern day first-person shooters currently on market shelves. With the 2010 version of Goldeneye 007, Eurocom tried to recapture an golden era in video game history. Sadly, their attempt falls way short, and for the asking price $49.99, you can probably find a better FPS for the Wii elsewhere.